It’s been 15 years since John and Babe Shepherd opened Red Mill Burgers on Phinney Ridge. 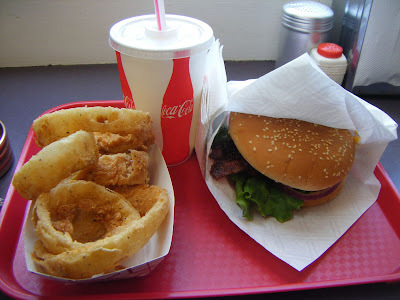 In the years since, the brother-and-sister team opened a second location at Interbay and continue, in my opinion, to serve some of the best not-so-fast-food burgers — and certainly the best onion rings — in town. Go eat some burgers! Starting tomorrow, January 15, for 15 days, the Shepherds will donate 15 percent of Red Mill’s profits to the following non-profit agencies: the Greenwood Food Bank, Greenwood Senior Center and Phinney Neighborhood Association. They’ll also be selling commemorative T-shirts ($15) created by Red Mill employees. Red Mill Burgers: worth the wait (photo courtesy Red Mill Burgers). Babe’s onion rings rock my world. Of course, it’s a whole lot easier to take a trip to Red Mill and order up a batch — with 15 percent going to a good cause. But if you’re the DIY-type, why not fry some up at home? And while you’re at it, howzabout grinding up some homemade burgers (here’s my how-to) to go along with them. 1. Peel the onions and and cut them into 1/2-inch-thick slices. Separate the onions into rings. Discard the inner center pieces, which are too small, or reserve them for another purpose. 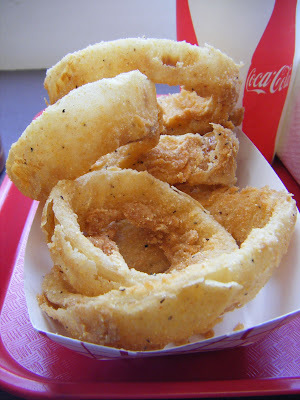 You will need three bowls for breading the onion rings. In the first bowl, place two cups of the flour. Pour the buttermilk in the second bowl. In the third bowl, combine the remaining two cups of flour with the cornmeal, masa harina, paprika, salt, cayenne, thyme, and black pepper. Line two baking sheets with parchment or wax paper. As you bread the onion rings, use one hand for dry ingredients and one hand for wet ingredients to avoid a gloppy mess on your hands. In batches, dip the onions in flour, then buttermilk, and then seasoned flour mix. When necessary, to keep the flour clean and easy to work with, sift the seasoned flour mix and discard any clumps of batter. Place the breaded rings on the baking sheets and place the sheets in the refrigerator for one hour to set.